FILE - Cambodian farmers plant rice on the dry earth in the rice paddy on the outskirts of Phnom Penh, Cambodia. 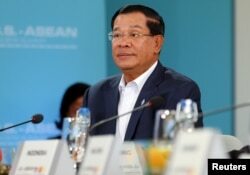 FILE - Hun Sen, Prime Minister of Cambodia listens to U.S. President Barack Obama speak during a 10-nation Association of Southeast Asian Nations (ASEAN) summit in Rancho Mirage, California, Feb. 15, 2016. Hanoi pressed Bangkok to use the Mekong River Commission (MRC) for resolving such issues before they escalate in the future. The MRC, however, has suffered large funding cuts from international donors who are upset with the commission and allegations of mismanagement and corruption. 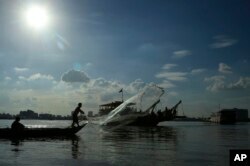 FILE - A fisherman casts his fishing net next to a ferry in the Mekong river near Phnom Penh, Cambodia, Tuesday, Dec. 1, 2015. It's a huge advantage at the negotiating table with the Mekong River countries: Cambodia, Laos, Myanmar, Thailand and Vietnam. Vietnam's Minister of Agriculture and Rural Development, Cao Duc Phat, is quoted in a state-run media outlet as saying 139,000 hectares of land within that country's borders have been contaminated by salt so far, and this will continue to rise at least until the start of the next rainy season, which is usually in June. “In Cambodia, in Laos, in Vietnam or in Thailand, they already convert - to be agricultural development to be industrial. So this is another root cause,” he said.